I've mentioned before that I am a sucker for cute little kids' clothes. I mean, there's just something so stinkin' adorable about a dressed up baby girl or a handsome little man wearing a matching outfit. Honestly, my kids are better dressed than I am about 95% of the time. So of course, I was extremely happy to work with Zutano for a review of a couple of their Spring outfits! If you haven't heard of Zutano before, they are a Vermont-based kids' clothing company that believes that little people clothes should be simple. We're talking easy to put on, easy to wear, and easy to wash. They offer a ton of adorable prints patterns that range from stimulating to soothing, that can all be mixed and matched to create endless outfits. Zutano's unique styles just scream playful and are so soft and comfortable! 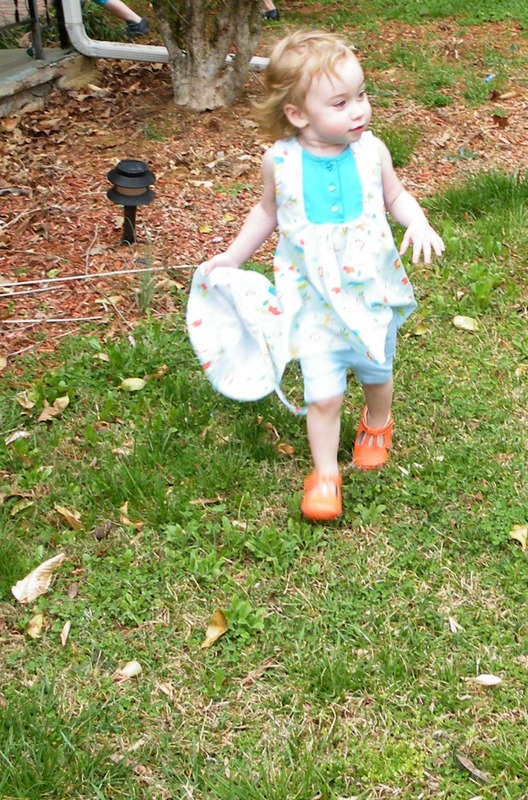 Kaya was sent the sweetest little dress in the Juba pattern, with a matching sun hat and baby pants. It fits like a tee shirt, loose and comfortable, and gave her that free-range of motion that all toddlers seem to need. I love the soft cotton fabric because it breathes well and lets her play without hindering motion. 1. Juba Darling Mini Dress ($26) - a sleeveless short dress with an a-line cut and waistline flare. Part shirt, part dress, this piece features our Juba print with a solid pool placket at the front collar that has buttons in a henley style. Little girls who love to play will adore this comfy style. 100% Interlock cotton. 2. Mandarin Terry Baby Bodice Jacket ($36) - This tailored jacket features two large buttons and a pleated bottom combining a dressed up look with ample room for accommodating all of baby's play. The slight flare is perfect for little girls. Pair this 100% cotton jacket with Florilee or What a Zoo prints to create an adorable outfit. Imported. 3. Pool Candy Striped Baby Pants ($19.50) - Our pants are made with ease and comfort in mind. Zutano pants slip on effortlessly over long sleeve and short sleeve onesies and pair perfectly with tees. 100% Interlock cotton. Imported. 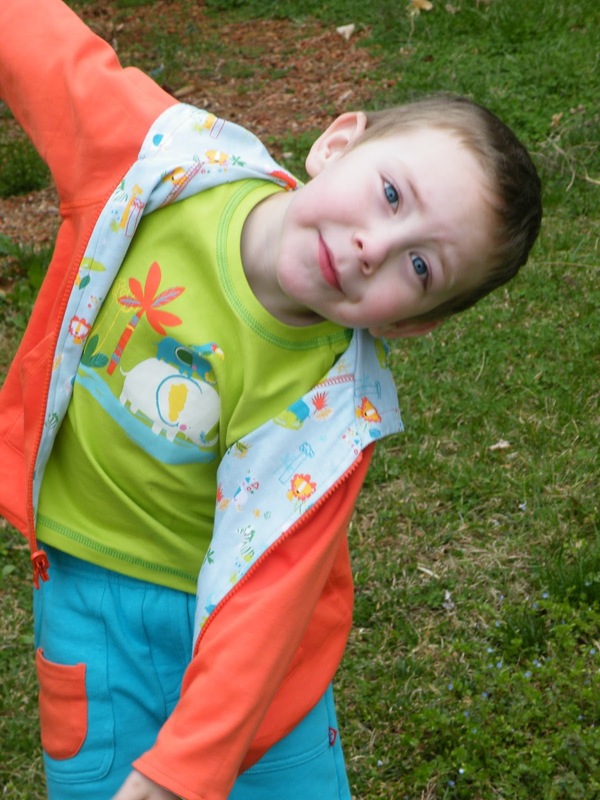 The outfit Sammy received is all boy. From the cute elephant print on the tee shirt to the loose shorts, he was in love with it as soon as he saw it. The bright colors and animals had him dancing and showing off - I think we have a new favorite outfit. When I asked him what he liked about it, he said, "Mama, there's pockets in the front and pockets in the back, and I can carry my cars with me!" So, I think we have the ultimate winner here. The shorts are my favorite too; they're thick and soft, but breathable so I know that they'll be durable and last through his rough boy antics! 1. Splish Splash Toddler Short Sleeve Screen Tee ($22) - This fun lime tee has a playful Juba design of two stacked elephants with a bird on top, enjoying the watering hole. A fun staple for your little boy's summer wardrobe! 100% Interlock cotton. Imported. 2. Juba Toddler Reversible Zip Hoodie ($48.50) - The perfect wardrobe addition for a toddler who loves animals, featuring our sweet Juba print on one side and solid mandarin on the reverse. Add this basic style to your child's wardrobe for everyday wear. This versatile piece can be paired with numerous outfits. 100% Interlock cotton. Imported. 3. Pool Toddler French Terry Big Pocket Shorts ($35) - Big on style and comfort, big pocket shorts are made from Zutano's soft 100% cotton French Terry fabric with a faux button closure and an easy elastic waistband. Two functional front cargo pockets are embellished on the right side with a tiny contrast mini pocket, adding a whimsical surprise. Back patch pockets have another fun detail - a cute little grommet. A super choice for little explorers who like to stow things away! Featured here in our bright pool blue. Imported. 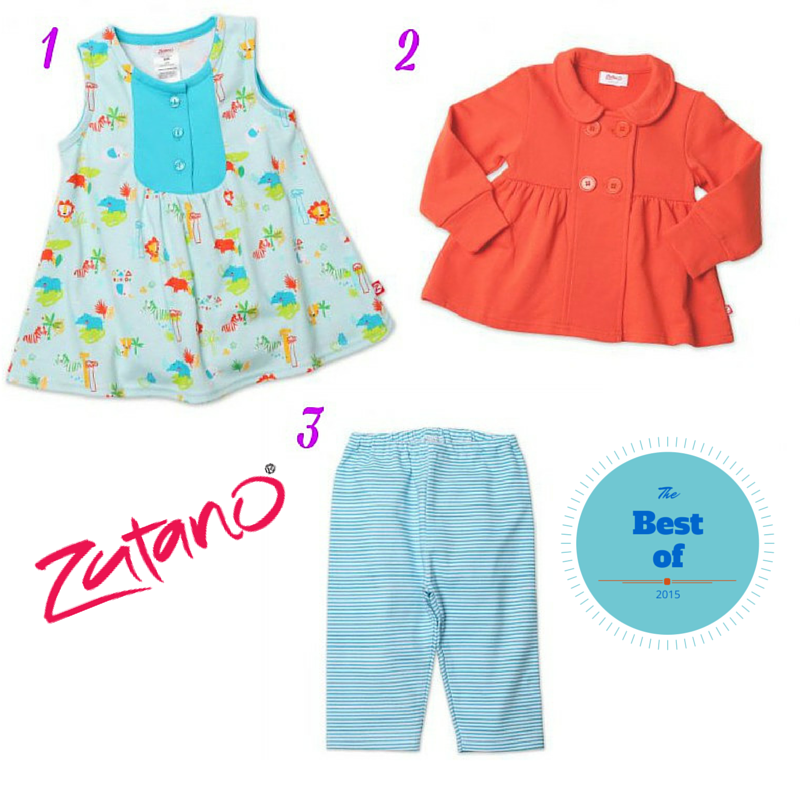 For more information about Zutano, and to check out their awesome selection of cute baby and toddler clothes - visit their website at www.Zutano.com. You can also find them on Facebook, Twitter, Instagram, and Pinterest. 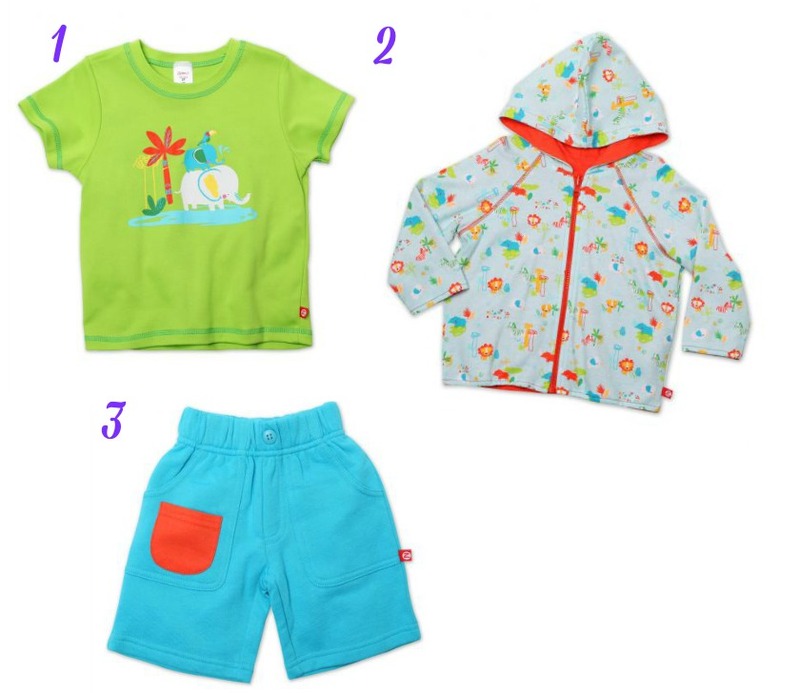 What is the most important feature to you when shopping for baby clothes? Disclosure: I received the aforementioned products in exchange for an honest review. No other compensation was received. All opinions are 100% my own.